Mexico's main leftist party said Wednesday it won't concede the presidency without a ballot-by-ballot recount, intensifying fears of political chaos and violence after the nation's closest presidential race ever. Leonel Cota, president of the leftist Democratic Revolution Party, accused election officials of deliberately mishandling the preliminary vote count in an effort to confirm ruling-party candidate Felipe Calderon as president. He said Andres Manuel Lopez Obrador won Sunday's vote despite the fact that the preliminary count had him losing by a single percentage point. As the recount began, the Conservative Party accused the Leftists of trying to trash the election, reports CBS News' Adrienne Bard. The Left is implying the vote count was rigged in some way. Election workers across the country began the official count on Wednesday, reviewing the tallies compiled on election day by polling-place volunteers. Under law, they must work around the clock in an effort expected to take days. By Wednesday afternoon, they had reviewed votes from 36.6 percent of polling stations, CBS News reports. 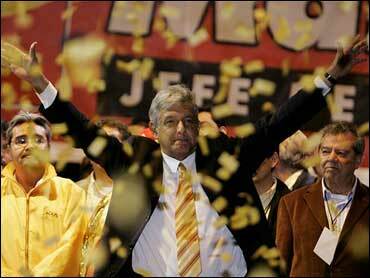 Election workers said 37 percent of those votes had gone to Lopez Obrador, compared with 34 percent for Calderon. Under law, they were not reviewing individual ballots except in cases where the packages appeared tampered with, or their tallies were missing, illegible or inconsistent — including at least 2.6 million ballots that would shrink Calderon's lead to 0.64 percent, election officials have said. Cota called on electoral officials to halt the count and start over, checking each vote instead of simply reviewing the tally sheets. But there did not appear to be any provision in Mexico's electoral law for a nationwide vote-by-vote recount. Once the count is complete, the Federal Electoral Tribunal — comprised of seven judges nominated by the Supreme Court and confirmed by the Senate — hears any complaints and can even overturn elections. By law, it must certify a winner by Sept. 6, and its decision is final. Cota said the party might take its case to international tribunals. Both candidates have declared victory, prompting scoldings from Luis Carlos Ugalde, the president of the Federal Electoral Institute, or IFE, who said Wednesday: "No political party can declare or affirm, at this time, that its candidate has received the largest number of votes." Lopez Obrador called again Wednesday for his supporters to remain calm, but he could mobilize millions — as he has in past legal disputes. He hinted Wednesday that he might do that again if he doesn't get his way. "The political stability of the country hangs in the balance," he said. Calderon suggested at a news conference Wednesday that demonstrations would be irresponsible. "We could also call for protests, but the vote can't be replaced by demonstrations," he said. He criticized Lopez Obrador's allegations that the vote was tainted, saying: "They are trying to undermine an election without having the results to back it up." The review that began Wednesday is a crucial step in proving the elections were clean to a nation that emerged only six years ago from 71 years of one-party rule replete with election fraud. Failure to convince the public and candidates it has been a fair vote could spark widespread civil unrest. "Such a close race is a nightmare scenario," said Ted Lewis, an election observer for the San Francisco-based Global Exchange. "If the ruling party wins by a hair, a lot of people will jump to the conclusion that something is amiss." The battle has prompted concerns of a return to Mexico's fraudulent electoral past, despite assurances by most international observers that the election was fair and properly carried out by Mexico's world-renowned electoral system, held up as a model to emerging democracies in Iraq and Haiti. Lopez Obrador aide Claudia Sheinbaum said Wednesday that the party found "very grave inconsistencies" in at least 50,000 polling places. About 35 Lopez Obrador supporters set up camp Wednesday outside IFE's gates, draping banners that accused electoral officials of being traitors. "We are just trying to defend our democratic institutions," said Alejandro Robles, a 22-year old student. "We carried out our duty: to vote. Now we see the actions of the electoral officials as very suspicious."